I'm hoping to produce 3 posts for the new year. This one will be more familiar for long time readers as I try to keep it constrained to data that is freely and widely available. A second post will use my estimates of additional data to provide a fuller illustration of that state of Ontario's electricity sector in 2015, and the other will hopefully be more disruptive, connecting data to provincial, national and international events and personalities. Ontario's simplest electricity data is hourly data from Ontario's electricity system operator (IESO) for demand, imports, exports and Hourly Ontario Energy Price (HOEP). 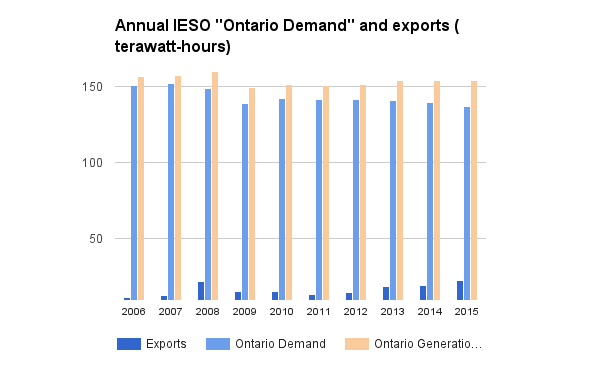 Using only this hourly data annual "Ontario Demand" is indicated as lower than it's been since the market opened in 2002 - and using other data available on the IESO site the demand is lower than it's been for over 2 decades. 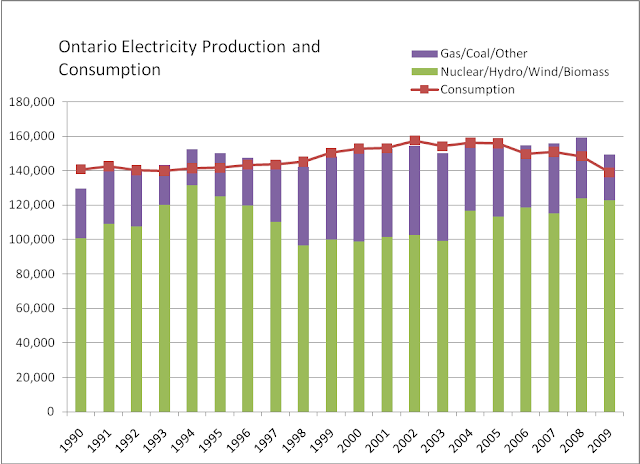 Curiosity took me back to a graphic in my first blog post, in 2010, which confirmed it has been a full quarter of a century since Ontario's generators produced less than the 137 million megawatt-hours (MWh) the IESO shows as "Ontario Demand" in 2015. Ontario Generation is calculated, in the graph above, from the base IESO data as "Ontario Demand" plus "exports" less imports. 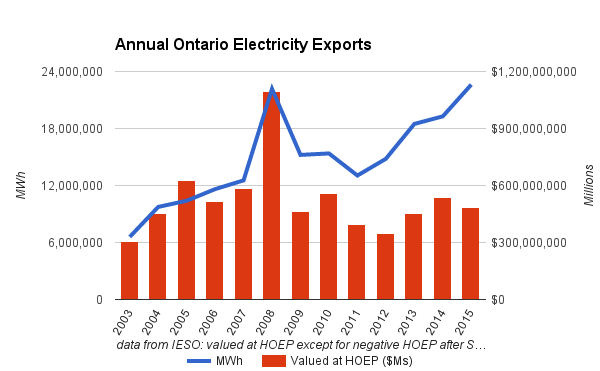 As that generation exceeded provincial demand by more than ever in 2015, it's not surprising the weighted average market price (HOEP) set a record low at $23.58/MWh. Record low pricing was accompanied by record high exports. Valued at hourly rates (except when negative after the banning of negative priced exports) revenues from exports look to have been 56% lower than in 2008 - the previous record export volume. The market rates provided a smaller share of electricity supply costs than ever in 2015. The global adjustment is, essentially, the difference between the costs of supply and the amount recovered from market sales. 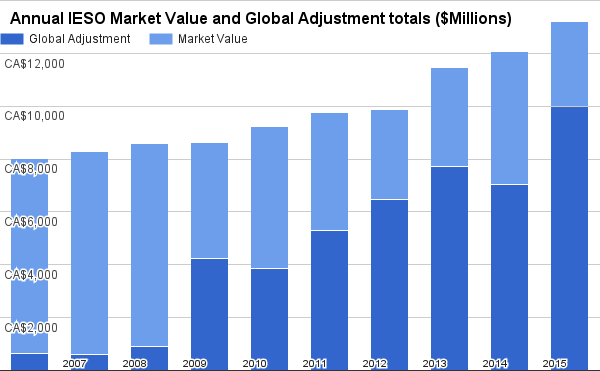 Using the estimate for December 2015 the annual global adjustment adds $10 billion to a market value (Ontario and exports) of $13.2 billion. For the first time the market pricing mechanism failed to recover 25% of the costs of supply. During 2015 I wrote on the growing shortcomings of the IESO's reporting on demand and supply. Demand was higher in 2015 than the IESO's "Ontario Demand" indicates. It was still very low compared to most previous years, but actual metered consumption of electricity in the province was almost certainly higher than in 2009 - and about equal to 2010 and 2011. There are important implications of the shift in the recovery of supply costs that aren't possible to explore with the base IESO data. Similarly, the rising total supply costs calls for explanation - and much of that explanation lies in generation beyond the reporting of the system's operator. The following post will use less accessible data, and estimates, to show the annual costs in 3 consumer segments, and the changes in supply cost over the past 5 years.